Indicator-Multiload (or System Load Indicator) is an Ubuntu Application Indicator that displays the network up/down speed as well as CPU, Memory and hard disk usage on the GNOME / Unity panel using a graph, just like the old System Monitor GNOME applet. A new Indicator-Multiload version was available in its daily builds PPA for some time and today this new version seems stable enough so it's finally available in the "stable daily builds" PPA. The new version displays detailed system info when clicking the AppIndicator such as the exact memory and CPU usage, network upload / download speed and so on. This was badly needed because Application Indicators can't display tooltips so using the previous stable version you could only see a graph but no exact values. Also, the bug in Unity that was causing a memory leak when using Indicator-Multiload was fixed according to this bug report. 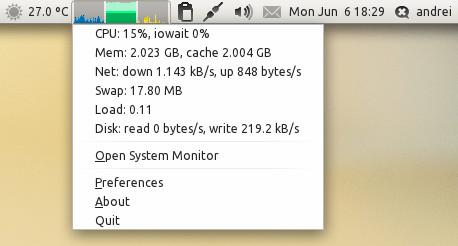 Once installed, search for "System Load Indicator" in Dash to run it. If you want to get updates faster (but it may be buggy), use the daily PPA.